For a fairly small city, there is an abundance of creative work out there about Savannah. 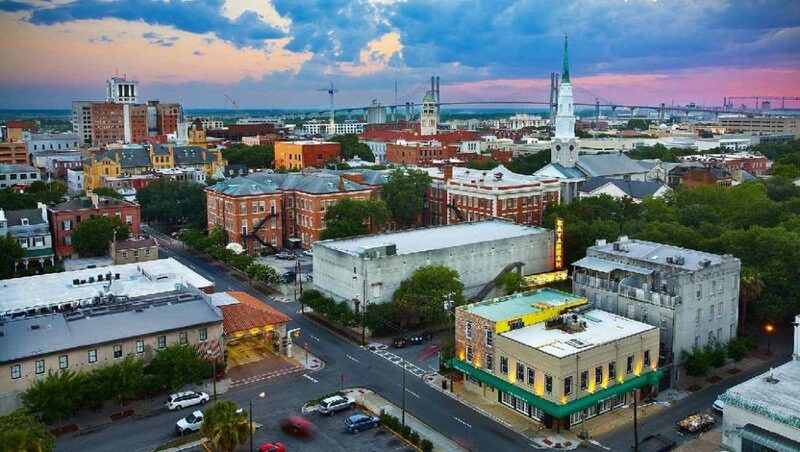 “Forrest Gump,” “The Legend of Bagger Vance” and “The Prince of Tides” all take place at least partially in Savannah. Of course, the most famous work about the city is “Midnight in the Garden of Good and Evil.” I’ve had seen all of these movies and I was impressed by the warmth, the relaxed pace of life, the historicity and the air of mystery in Savannah that these films seemed to convey. That’s when me and my wife decided to visit the town. Naturally, we did some research on the city and we soon discovered that one of the reasons for Savannah’s uniquely historic layout is due to the fact that during the Civil War the city fathers wisely surrendered the town to Sherman’s army without resistance on the condition that they do not trash the place. 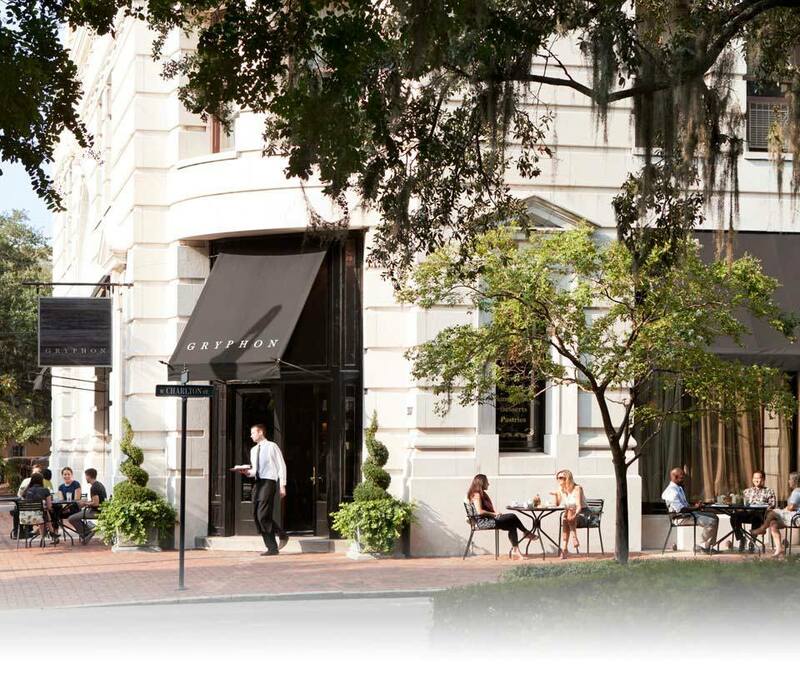 Sherman honored his part of the deal and thus today Savannah is the most authentically prewar southern city. We’ve chosen the McMillan Inn on the outskirts of the historic district and reserved the Gaston Room for four days. Our plan was to transfer to the Tybee Island Inn on the coast for the remaining three days of our trip. Our room was very well appointed. Our eyes were drawn to the plush bed, the large hot tub and the fireplace. When we’ve arrived we’re still starving to death so while my wife freshened up in the bathroom I got out the hotel directory and began calling around looking for an open bar or restaurant that would feed us at eleven o’clock at night. We got lucky with a pub on Bull Street that would be serving for another hour. We rushed out of the house and out into the night. Although we were apprehensive about venturing out in an unknown city at that hour, once we reached the intersection of Gaston and Bull, where Forsythe Park begins and saw that nighttime Savannah is well lit, fragrant and peaceful, we really began to get excited about what lay ahead. The pub was warm, welcoming and served massive portions of deliciously unhealthy soul food. Savannah is filled with great activities and sights. Below I’ve listed the most memorable ones to me. 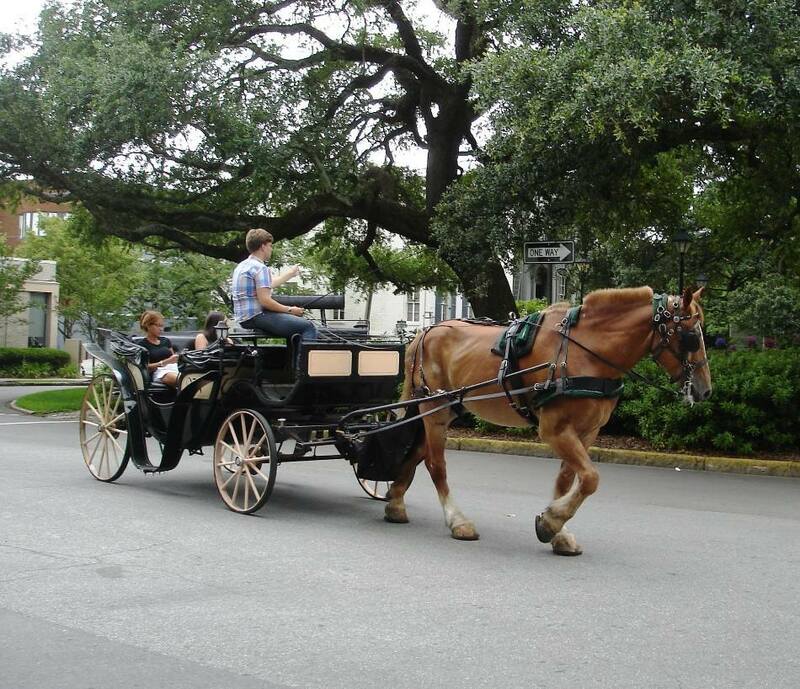 There are many horse-drawn carriages strolling lazily along Savannah’s cobblestone streets and around the many squares. My wife and I climbed aboard with a half dozen other people for a ride from the art galleries around the city market. Our driver, a young woman in period clothing and a strong southern twang pointed out the homes of prominent citizens, churches, and synagogues along the route. We found out that our horses, Sonny and Cher, are well fed and get more days off than most 9 to 5 office workers. The carriage ride is Savannah is taken leisurely, which is how it should be. 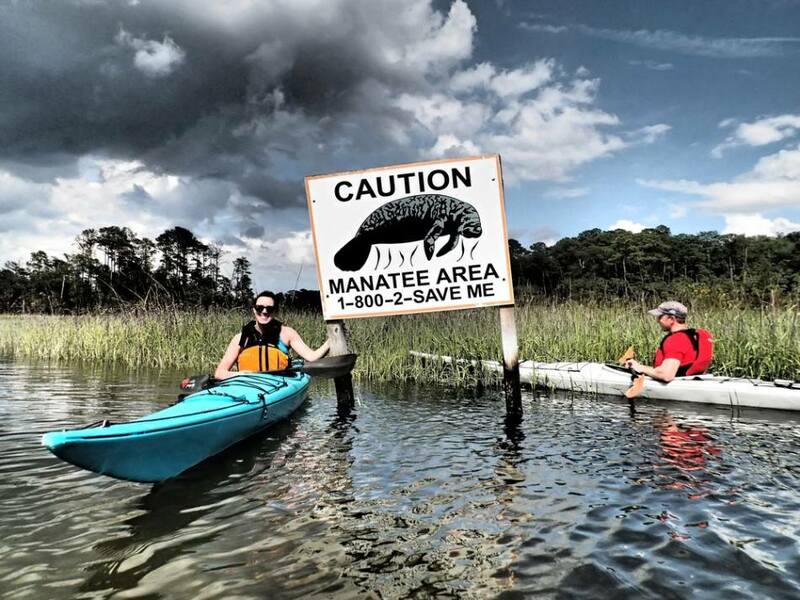 One of the most anticipated activities on our itinerary was kayaking the wetlands between the city and the Tybee Island barrier islands. The dock from which we set off on our journey is actually a tourist attraction of sorts as the same marina at which Forrest Gump parks his shrimp boat in the film. When we arrived there by bicycle, however, the place was almost deserted. Most of the kayak rental offices we called were not renting boats because the weather was too windy. We found one office, however, that was manned by a young attendant who seemed to know less about kayaking than we did. He didn’t seem to notice that we were woefully attired for kayaking in jeans and sweaters. At one point he even asked us how to stow our gear in the wet bag provided. Within minutes of our auspicious arrival, however, we were on the water. A word of warning: when kayaking tidal wetlands go BETWEEN the tides. We were on the water at the arrival of high tide and thus we were constantly fighting the inland current, trying to stay out of the reeds. We did get to see herons and dolphins in the distance. When we somehow managed to get back without dying, however, our hands were chafed, our clothes were soaked, our skin was caked with salt and we were deeply sunburned. 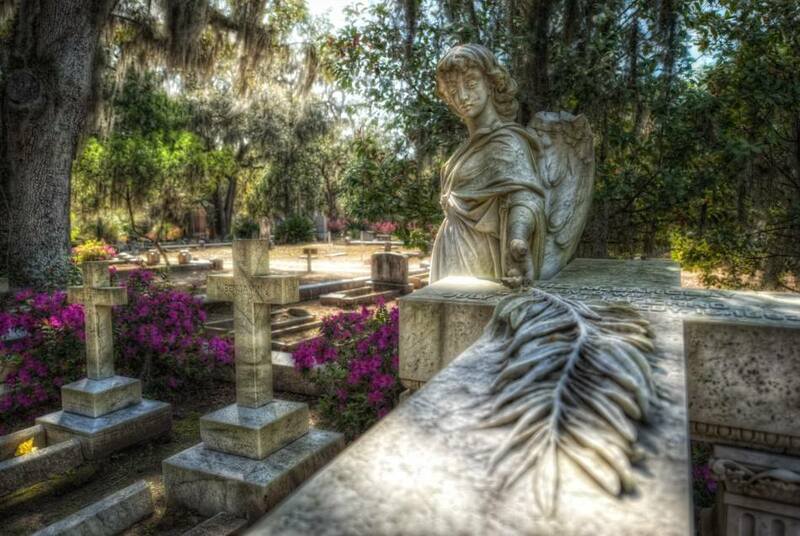 Although there is a colonial-era cemetery located in Savannah with graves dating back to the 18th Century-and its certainly worth seeing, one of the city’s great attractions, made famous by the movie “Midnight in the Garden of Good and Evil” is Bonaventure cemetery, in a neighboring district called Thunderbolt. Bonaventure’s location is positively ethereal. It’s located along peaceful wetlands of sunshine, water and waving reeds but at the same time shaded by large leafy oak trees. The graves themselves are works of art. 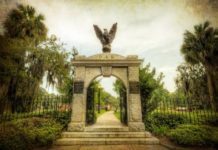 During the 19th and 20th century the elite of Savannah society sought to outdo one another in the afterlife by constructing elaborate stone monuments and statues. There are lifelike statues of angels, women and little girls, pyramids and columns. The poet Conrad Aiken is buried there beneath a tomb shaped like a bench. In his plot are also his parents, whose claim to fame is that they died on the same day. As “The Book” explains, Aiken Senior supposedly killed his wife because she was frittering away the family fortune on wild parties. Then he killed himself. Savannah is full of such juicy scandals set in a backdrop that closely resembles paradise. In October the ocean is still quite warm in Savannah. 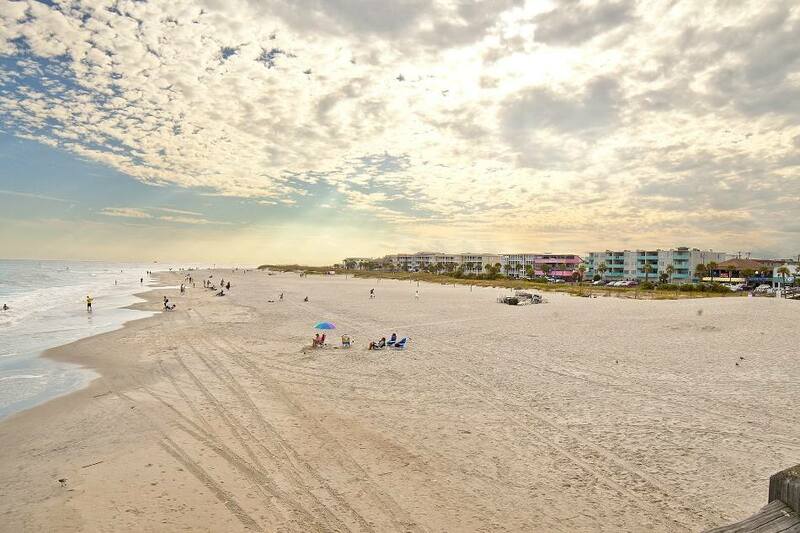 The beaches on Tybee Island are very broad and shallowly sloped with hard packed, almost glassy sand. We had a wonderful time wandering around in shorts, enjoying the warmth of the ocean. There were several tide pools filled with an array of shells and sea life. We stooped to watch nautiluses scurry along the sand. In the reeds along the sand dunes, we also were treated to the appearance of white-shelled ghost crabs, which watched us in apprehension. I found my first intact sand dollar in Savannah. The crab shack is another classic Savannah recommendation. 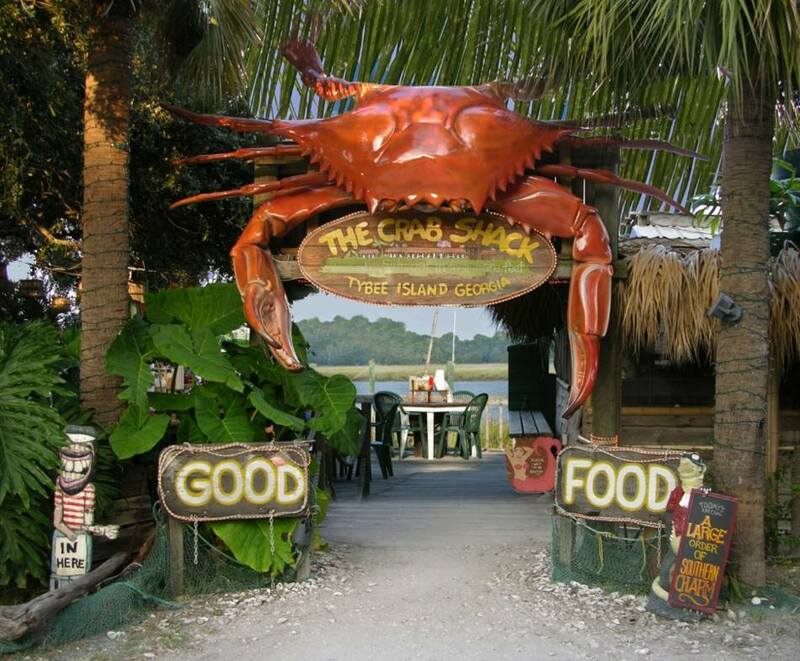 Located between the city and Tybee island, the Crab Shack is actually set back on a bayou reached by a pitch black road leading off of the highway. We biked there from the Tybee Island Inn in total darkness, which was another one of our more hazardous experiences on this particular trip. We thought we were going to the wrong place until we actually got there and saw that the crab shack is a well lit festive complex of buildings built over the wetlands. We parked our bikes and were seated at a table. Dining at the crab shack is a rather informal affair. The tables are actually made of plywood with a hole in the middle into which you can discard the shucked remains of crayfish, crab legs and the like. Naturally on a swamp in summer there’s lots of local fauna that seek to share your meal so the proprietors have installed industrial fans to blow away the mosquitoes. There are still plenty of palmetto bugs on the floor, however, and in the garbage. We chalked it all up to the atmosphere. We dined on a local favorite, the Low Country Boil. The platter of food that came to us could easily have fed four. The Low Country Boil is an ambrosial concoction of shrimp, crayfish, oysters, king crabs, Jonah crabs, sausage, potatoes and corn all coated with butter and Old Bay. After eating about a third of this meal, washed down with sweet tea and lemonade, we were about to make our way home when we noticed the alligator pits. The crab shack has a shallow pool filled with juvenile alligators, which are destined for adulthood in gator farms. For a small fee, you can feed them with pieces of shrimp fastened with clothespins to the end of a fishing pole. There are many options of Crab Shacks in Savannah nowadays. The Crab Shack is the original one. 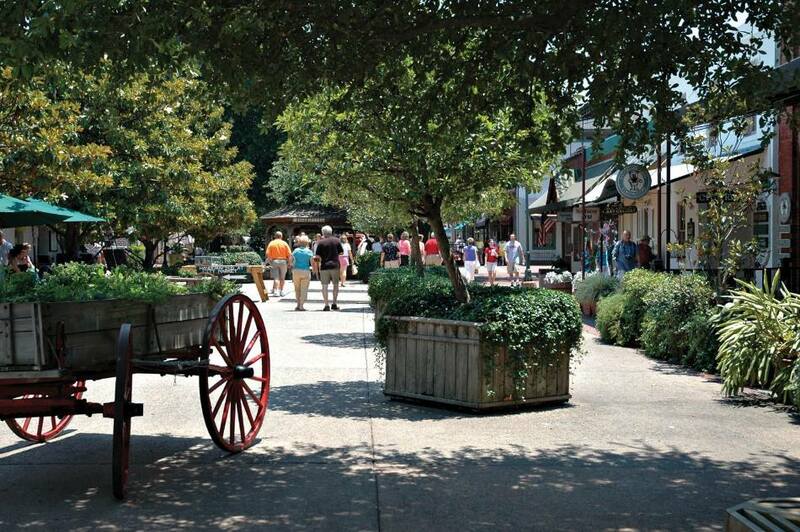 The Savannah City Market is a sort-of mall for local artists. You can go from shop to shop browsing the work and chatting with the artists. Unfortunately, we were less than impressed with the landscapes and still lifes that most artists were selling. Then we met Brian. Brian is a young artist from Virginia who came to Savannah to pursue his career as an artist. His work mainly involves the ideas and imagery taken from dreams. His work depicts various dreams that he or others have shared. He actually has a guestbook in his shop into which you can write down any dreams that you’d like to share. In some of his work he shrinks down these anonymous dreams of strangers and pastes them to a block of wood to form a canvas over which he overlays imagery. We bough two of his wood block paintings for a reasonable fee and enjoyed our discussion with this bright and talented young creator. 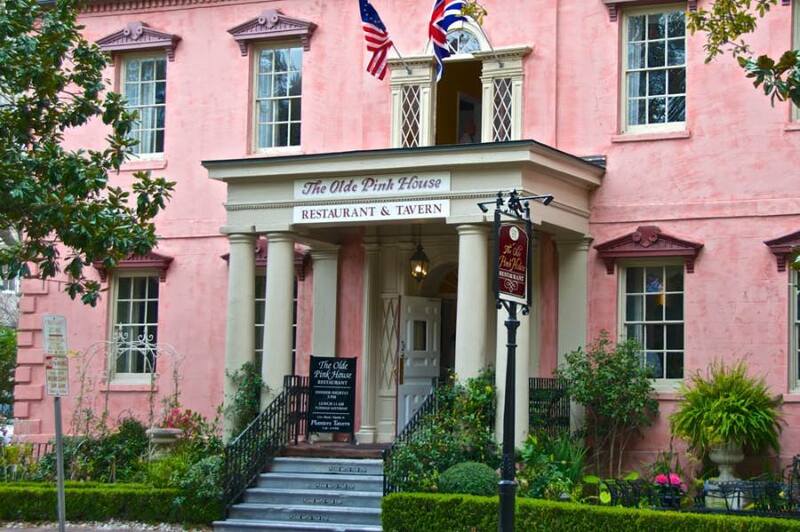 The Olde Pink House is one of Savannah’s oldest and most prestigious restaurants. It is set in an 18th Century building on Reynolds Square, close to the waterfront. After getting properly dressed up, we decided to call a pedicab (bicycle taxi) to take us to the restaurant. Our driver arrived in his passenger-bearing bicycle. He was a young SCAD student who pedaled us along the scenic route to our dinner. The night was redolent with the smell of flowers and sea breeze. We found this ride to be one of the most romantic moments of our trip. When we arrived at the Olde Pink House we were seated in a small drawing room with a handful of other tables. Our server guided us through the specialties on the menu. Of our succulent meal, the she-crab soup and tuna tartar were particularly memorable. On our first day in Savannah, we wandered around the city, taking in the squares, statues, Spanish moss, and the splendid sunshine. Wandering through the center of town down Bull Street we decided to stop at the Gryphon Tea Room. The Gryphon Tea Room used to be a drug store a century ago. The Savannah College of Art and Design bought it and had it converted to a café, which now serves both college students and tourists. Inside there are still many old wooden drawers that used to hold drugs along with other pharmaceutical implements. Our lunch was an absolute treat. We each had a bowl of cream of asparagus soup along with a shared green salad topped with apple, walnuts and breaded goat cheese fritters. A delicious, economical and atmospheric meal. 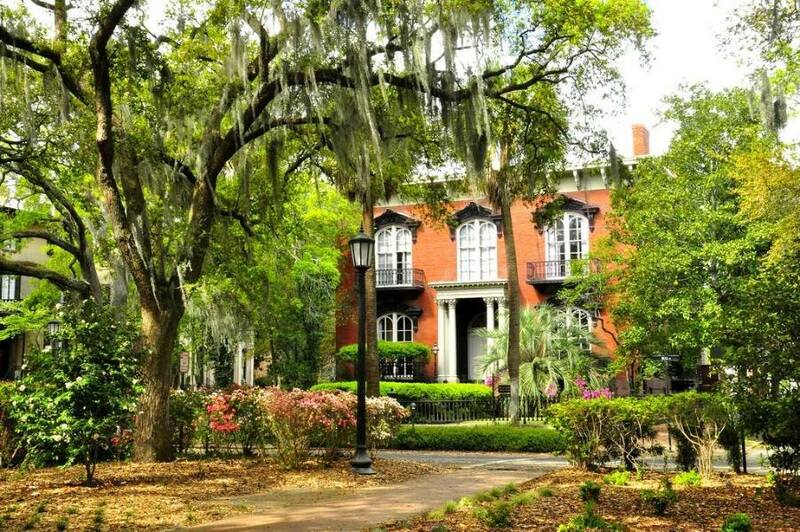 One of the best things to do in Savannah is just to chill out outside. 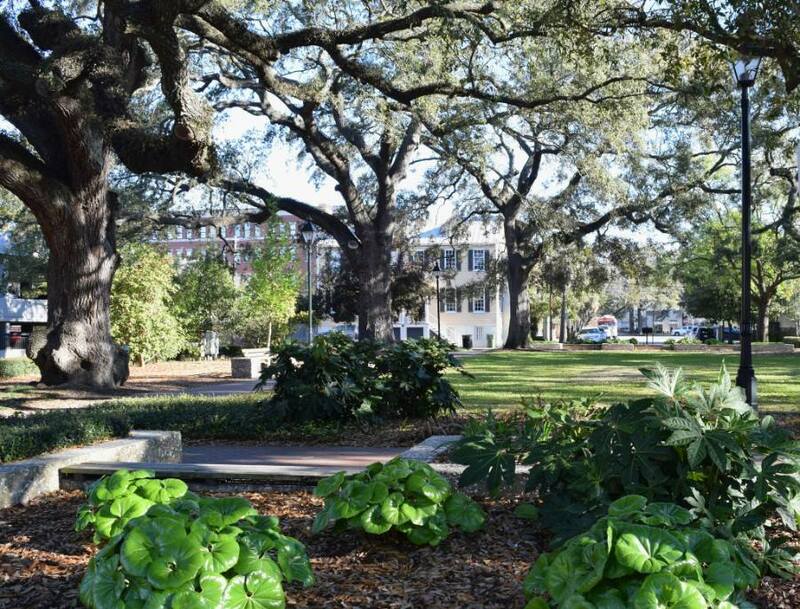 The squares are filled with benches nestled in the shade beneath the Spanish moss. Forsyth Park is one of the greatest parks in America, if not the world. With its Parisian style fountain, large trees, Confederate war memorial and wide open lawns, Forsyth is the perfect place to have a picnic. We did have a lunch of vegetarian sandwiches, curry flavored cashews and Odwalla drinks from a health store fronting the park. We sat on the Forsyth lawns watching people throwing Frisbees to their dogs and college students practicing tightrope walking along a cord stretched between trees. When we put a couples massage on our trip plan, we thought it might be a bit of a stretch. But it worked out great. Upon the recommendation of our B&B; proprietor we chose the Sweetwater Spa on Abercorn Street. The spa is located in a stately 19th-century mansion and the staff is all extremely polite, offering tea and congratulating us on our wedding anniversary. For our massage, we were taken into an upstairs room, which was a dimly lit affair with high ceilings and a fireplace. Our massages were pure heaven during which we looked across the room at one another and smiled at such treatment. The Travelerr is a culture and travel digital magazine that inspires people to explore the world’s culture through great content produced by travelers and locals.